It is hard to find a kid who has not succumbed to the charms of The Wimpy Kid series, so if they need a new book to devour, how about one that features a troll – in middle school! Now don’t worry, I wouldn’t steer you wrong. This is a twisted take on the fairytales that any kid who loves to laugh will enjoy. Don’t forget to visit my website at www.onegreatbook.com for more books that will satisfy your kid’s book cravings after they have finished Diary of a Wimpy Kid. Zarf is a troll who is doing his best to survive middle school. This school is ruled by the princes and princess followed a close second by your knights and fair maidens. Of course your wizards and witches are bit geeky but trolls, well they are on the bottom rung. An incident between Zarf and Prince Roquefort leads to a duel (with nerf lances of course) and it ends up landing Zarf in the dungeons. The only way restore his dignity is to find the king (who has mysteriously disappeared) but Zarf is not exactly the brave and noble type, or is he? This book has been described and Shrek meets Wimpy Kid, and an apt description it is. 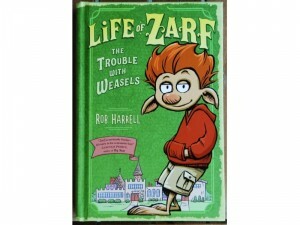 Zarf is appealing and hysterical as he tries to make the best of his rather low social standing. Of course when you have friends such as the jester’s son, who can’t tell a joke to save his life and the little pig who can’t get enough mutton, well the laughs keep coming. I can’t imagine a kid not giggling through this one. You also have to read this book if you want to know the fate of Goldilocks! Can anyone say lunch lady? Kids who like Wimpy Kid will eat this one up. Large type, appropriate content and pictures throughout make this book suitable for younger readers as well as middle school kids. I love the fairytale twist to this story, but with ogres and dragons, don’t worry, this isn’t Cinderella! I am a mom of three with a passion for literature! No matter what book series our kids devour, as they come to an end, we as parents ask the inevitable question – what is next? I am ever on the job, trying to answer that question. I try to do it with a variety of books. Some are silly, some true to life, some pure fantasy, but in the end I hope they make my children love words, explore new ideas, and laugh!